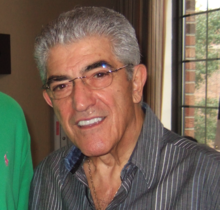 Frank Vincent Gattuso Jr. (August 4, 1937 – September 13, 2017), known professionally as Frank Vincent, was an American actor, musician and writer. He played well-known roles in the HBO series The Sopranos and in several movies for director Martin Scorsese: Raging Bull (1980), Goodfellas (1990), and Casino (1995). He was born in North Adams, Massachusetts. In 2001, Vincent voiced the character of Mafia boss Salvatore Leone in the controversial computer and video game Grand Theft Auto III and played the character again in Grand Theft Auto: San Andreas (2004) and Grand Theft Auto: Liberty City Stories (2005). Vincent died of complications from heart surgery in Nutley, New Jersey on September 13, 2017 at the age of 80. ↑ "Frank Vincent". The New York Times. ↑ "Frank Vincent, Mobster in "The Sopranos" and "Goodfellas", Dies at 80". The New York Times. September 13, 2017. Retrieved September 13, 2017. Wikimedia Commons has media related to Frank Vincent. This page was last changed on 16 September 2017, at 03:22.